As an art teacher, I have never been a big fan of stencils. I have seen students become quite dependent upon them and resistant to draw freehand. 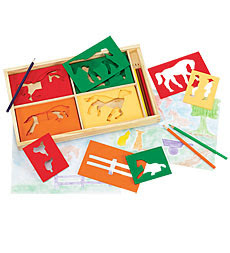 As an early childhood educator, I love stencils for developing fine motor skills. Children love the experience of filling in the positive space that reveals the image. Stencils are also very useful for exploring spatial relationships.
. It turns out the stencil is a wheelbarrow, but when it is held upside down, it does look like the violent image she saw. Note: When taking dictation from young children, it is important to write their words exactly as they say them and not to correct grammar, run on sentences, etc. Children need to learn the connection between spoken words and writing first. There will be plenty of time for grammar later on. Also, writing and letters are symbolic, as is drawing. 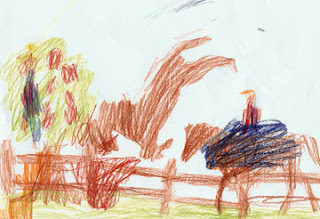 There is a natural progression in young children from drawing to writing, so it is good practice to write children’s words about their artwork and encourage them to write their own artist statements, even when they are only making letterlike forms.